This is a brand new product, Mae Pranom's awesome version of the popular holy basil paste sold by Lobo. Also similar to Por Kwan chile paste with holy basil. To use, just a bit of oil to your wok and start to fry the meat of your choice. Then add this paste and stir until the meat is done and you can smell the fragrant chile/basil mixture. Serve with fresh jasmine rice, and enjoy! Ingredients: vegetable oil, chile, seasoning sauce, holy basil leaves, garlic. Jeff, Lansing MI. I would like to thank you for continually improving your selection of products. More and more, you're offering items of much higher quality than I can find in any of my local markets. 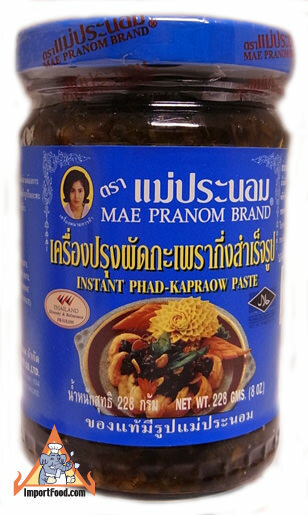 For instance, the Mae Pranom Pad Grapao Paste I recently bought from you is far superior to other 'instant grapao' items, at a better price. It's an item i haven't found anywhere from here to Chicago - so today i purchased more to keep as back-up, along with other Mae Pranom items and some of my favorite fish sauce, oyster sauce etc. I also use your recipe section all the time. Thank you and keep up the good work! Patrick, Bainbridge Island WA. Due to your recommendations I have become addicted to everything Mae Pranom makes. Their holy basil paste is incredible. I smear it on halved hard boiled eggs for lunch. The yellow label Prik Pao is wonderful! Hot and sweet with great flavor depth from the shrimp paste. I use your large granite mortar and pestle all the time now. If you are ever in Ballard and looking for some excellent Thai food definitely try Pestle Rock on NW market St. It is Northern Isan Thai and fantastic. Thank you for making these products easily available.